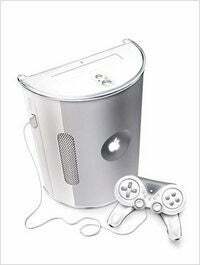 Would You Buy An Apple Gaming Console? The prospect of another company jumping into the console market is laughable to most people, and for good reasons. It isn't a market you can just leap right into. You need connections, capital, and consumers hungry for any product you put on the market. Over at Cnet's The Digital Home, Don Reisinger suggests that only one such company exists - Apple. Apple has the infrastructure in place through iTunes to create a real value proposition for those that want to extend the capability of their console beyond gaming and has the cash — about $20 billion — to not only invest in the best components on the market, but in an online gaming experience that could rival Xbox Live. That cash could also be put to good use by acquiring major developers (did someone say Take-Two?) that could go from third-party powerhouse to Apple's first-party publisher."